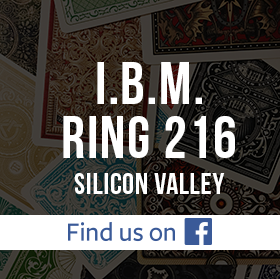 Fantastic turnout at the IBM Ring 216 Stage/Parlor Competition coordinated by our President Cal Tong and Vice President Raahul Srinivasan. Around 45 to 50 members and guests attended this magical event. In the standard division, we had the following competitors: David Gerard, David Martinez, Fred Rasmussen, Doug Eakin, and Nathan Hadsall. In the Masters Division, we had Phil Ackerly, Will Chandler, and Dan Chan. Stage/Parlor (Masters Division Results) will be announced at the Ring 216 Annual Banquet in January 2013. Contact Will Chandler for Tickets. Amazing performances by all our experienced competitors! Thanks for making this last meeting of the 2012 year a memorable event.